Take accurate readings with one hand! Perfect for forestry, rough surveying, and tower alignment professionals. 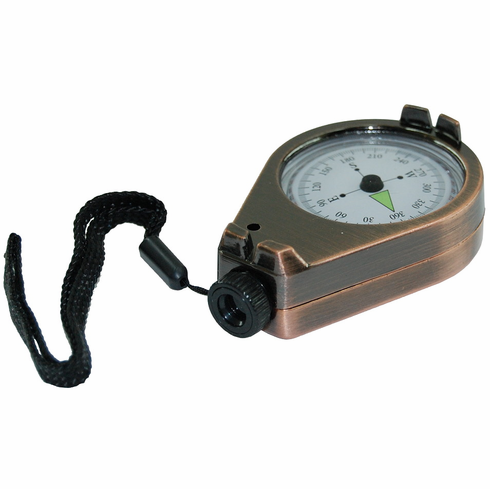 This classicly designed optical sighting compass from Deruite offers an aluminum body with a 1 degree resolution scale viewable through the sighting optic. The internal compass card rotating in the fluid filled capsule provides an accuracy of one-half degree, with a dampening time of less than 5 seconds. Each unit includes a wrist lanyard. Dimensions: 2in. x 3in. x 0.75in. Weight: 3.5 oz.